Click on chart for more commodities market data. The end is nigh, according to the Mayan Calendar. That's bullish for gold, right? For now, investors are more concerned about taxes going up next year than they are about a potential doomsday on Dec. 21, 2012. "Not knowing what the tax landscape will be like next year is causing many investors to cash in now," said James Cordier, president of Liberty Trading Group. Gold prices have tumbled from a high near $1,800 an ounce in early October to below $1,700 an ounce last week. While most investors anticipate lawmakers will reach a compromise on the looming fiscal cliff, taxes on capital gains and dividend payments are widely expected to go up regardless. 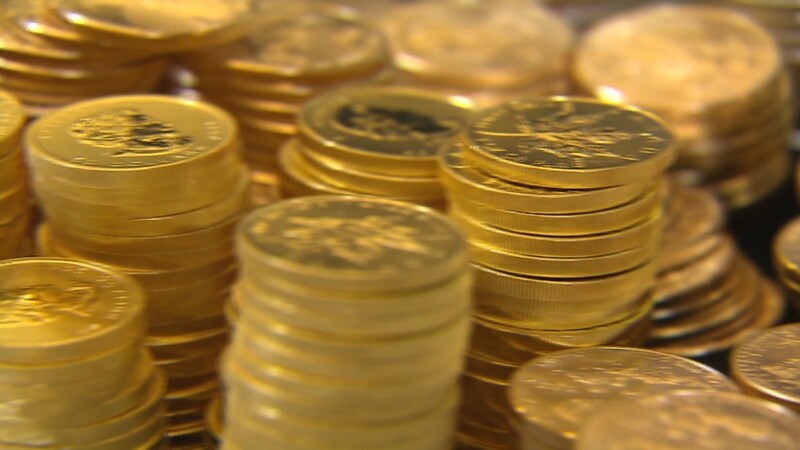 By exiting their gold positions this year, investors hope to avoid paying those taxes. But the fear of higher taxes is so powerful that investors are overlooking some positive fundamental factors, said Cordier. The depreciating U.S. dollar, for one, should be giving gold prices a boost. Since the metal is priced in U.S. dollars around the world, a weaker dollar makes gold futures more attractive to foreign buyers. Then there's the matter of all the economic and geopolitical uncertainty plaguing the markets right now. Gold is a tangible asset that should hold its value when other assets, such as stocks, get hit by market volatility. As such, it tends to attract investors during times of uncertainty. With that in mind, analysts say gold prices could rebound early next year if President Obama and lawmakers in Congress send the economy over the fiscal cliff. Gold is also expected to benefit from record low interest rates in the first half of next year. The Federal Reserve has maintained a zero interest rate policy for years and is expected to announce additional asset purchases to keep rates low when it meets this week. 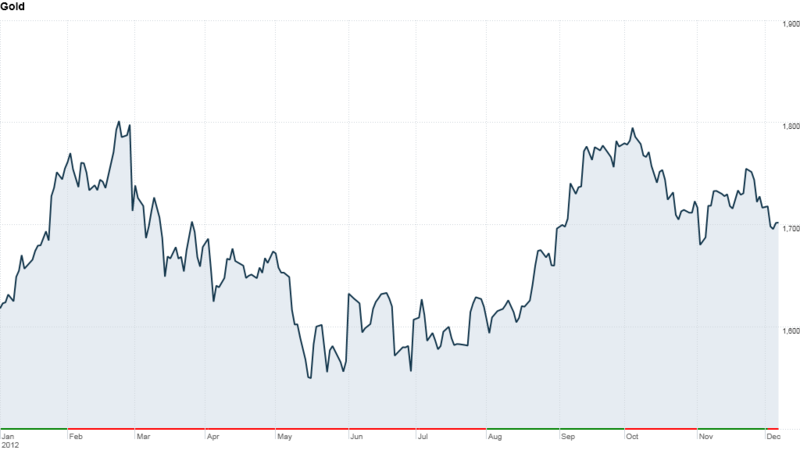 That will continue to provide "fundamental support" for gold in 2013, according to a recent report from Pavilion Global Markets. "We believe that gold is increasingly used as an instrument to play monetary policy and interest rates," wrote Pavilion analysts. "As rates fall, gold becomes 'less expensive,' and thus, more attractive." The European Central Bank's more aggressive stance should also help boost gold prices, according to Cordier. "When you're forgiving debt and printing money, that's wildly bullish for gold," he said. "For gold to hit new record highs in 2013 seems very possible." Should you invest your retirement in gold? While that may be the case initially, gold is headed for a fall in the second half of 2013, according to Wall Street's version of the Mayan Calendar. Goldman Sachs (GS) issued a widely-read research report last week that predicts a "turn" in gold's long bull run. Related: Gold demand slips ... but not for long? Over the past 10 years, gold has risen 518% from about $275 an ounce at the end of 2002 to current levels near $1,700 an ounce. Gold hit an all-time high above $1,900 an ounce in September 2011. This year, gold has gained about 8%. The bull market has been driven largely by declining real interest rates and increased buying by global central banks, as well as the Fed's various forms of quantitative easing, according to Goldman. But these trends are breaking down and gold prices will likely peak sometime over the next 12 months, although Goldman could not say exactly when. Goldman expects gold to average $1,800 an ounce in 2013, down from its previous forecast of $1,940 an ounce. The call is based on the assumption that real interest rates will gradually begin to rise from record lows as the U.S. economy strengthens in the second half of the year. "Our expanded modeling suggests that the improving U.S. growth outlook will outweigh further Fed balance sheet expansion and that the cycle in gold prices will likely turn in 2013," the report sates. "Risks to our growth outlook remain elevated however, especially given uncertainty around the fiscal cliff, making calling the peak in gold prices a difficult exercise."